No more bent and damaged artwork! ClearBags® customers have long-praised our packaging prowess and now we are offering our proprietary Airsafe™ art box design to you. 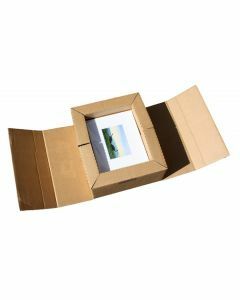 ClearBags Airsafe™ art boxes meet UPS and Fedex insurance standards for a full 2” of free air space between your product and the outer wall. Boxes ship and store flat. Simply roll-up both ends and tape the box shut. 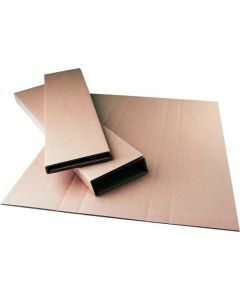 Made from 200# test corrugated cardboard.Quick and easy to assemble, learn how. Keep your art and photos safe with our proprietary Airsafe™ Boxes. Our AIR1620B box measures 16" x 3" x 20" and is designed to keep 16" x 20" pieces in place during shipping. A 2-inch cushion between your product and the outer wall prevents harm to your work. Meets UPS and FedEx insurance standards. No more bent or damaged artwork!